If you enjoy cooking Thanksgiving dinner, then we have some must-try recipes you and your family will love. Generally, a Thanksgiving meal includes the usual dishes: stuffing, mashed potatoes, sweet potatoes, casseroles, salad, pie, and, of course, the turkey. There are some families who enjoy eating the same recipes year after year. After all, it’s tradition. Then there are the families who want to deviate from their usual meal with some versatile dishes. You can still stick to the same dishes, but put a fun little twist on them. Thanksgiving is a day filled with cooking, baking, and eating, so if you want to spend more time with family instead of in the kitchen, then feel free to order a Thanksgiving dinner from Joseph’s Classic Market. Our meal includes traditional stuffing or sausage stuffing with cranberries, you can also get candied sweet potatoes or whipped mashed ones, and you receive roasted vegetables or green bean almondine. Of course, we’ll provide the turkey as well as some tasty desserts. Regardless of whether you’re going to be cooking your own meal or purchasing it, Joseph’s Classic Market is the place to pick up fresh food for the holiday season. If you’re cooking your own meal, then let’s get started on exploring some versatile fresh food recipes for your dinner. While you might love sticking to the same traditional recipes, sometimes it’s fun to step into the realm of whimsy and whip something up that’s just as delicious but with a fun spin on it. 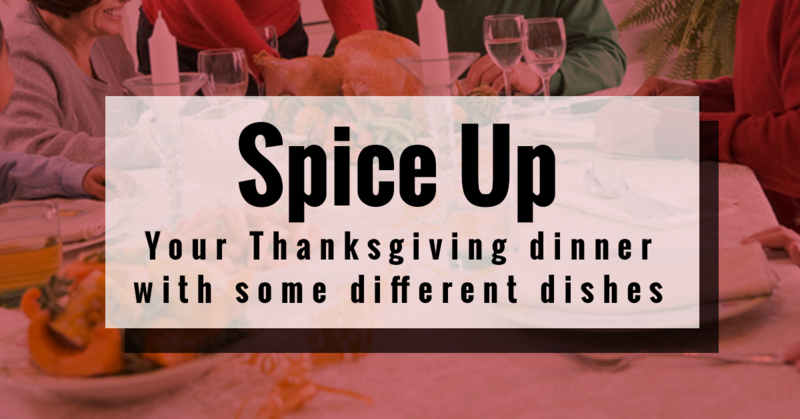 Spice up your traditional Thanksgiving meal with some of these delicious recipes and see what you think. You can always return to the same traditional Thanksgiving next year. For all of your fresh foods and to take advantage of some weekly and weekend specials, stop at Joseph’s Classic Market in either Palm Beach or Boca Raton. If your family loves casseroles, then dive into this delicious and nutritious casserole. This one is a great recipe for families with kids because they’ll learn to love brussel sprouts. When you add a bit of cheese and bacon to brussel sprouts, your kids and even some adults will realize that these vegetables are nothing short of mouthwatering. This recipe is a combination of creamy cheese covered all over roasted brussel sprouts and bacon. Find more details for the recipe here. If you want to change up your usual dessert options, then this apple pie salsa and cinnamon chips are perfect to do. Make this sweet salsa and these sugary chips the main dessert of the evening or you can have them as an appetizer. The chips are cinnamon sugar sprinkled and you’ll want to lick the apple pie salsa bowl clean. For this recipe, you’ll need apples, lemon juice, brown sugar, butter, cinnamon, nutmeg, cornstarch, vanilla, tortillas, and whipped cream. To find the full recipe, click here. If your family needs something to munch on while the turkey is cooking, then this appetizer is perfect. If you have vegetarians in the family, then you can make an alternative version of this as well with seitan. What’s great about this appetizer is that it’s not filling, it’s nutritious, and it’ll wet your appetite before you dig into the dinner. Roasted asparagus and bacon is very easy to make and is a great way to get some vegetables into a mostly carbohydrate-filled meal. This recipe includes only a few ingredients you probably already have on hand. You’ll need asparagus, olive oil, garlic, rosemary, salt, pepper, and bacon. You’ll want to drench the asparagus in the seasonings and the oil, then wrap the asparagus in bacon before you put it into the oven for 20 to 25 minutes. Instead of serving up some candied sweet potatoes, why don’t you try something a little different? This sweet potato cornbread is a definite favorite with most families. Who doesn’t love a combination of two Thanksgiving favorites? Enjoy cornbread with sweet potatoes slathered in butter, honey, or some delicious apple butter. This recipe is very easy to make too. You will use cornmeal, all-purpose flour, brown sugar, baking powder, baking soda, salt, pumpkin pie spice, sweet potatoes, eggs, buttermilk, honey, and butter. Find the recipe here. Stay tuned for our next blog for more tips for cooking and recipes for the holiday season. If you need any fresh ingredients for your dishes, don’t forget to stop at Joseph’s Classic Market.